The paper provides a review of recent developments on the world and local agri-food markets. Possible consequences for the EU agri-food supply chains and for their performance on inter-national and domestic markets are discussed. By revising recent literature the most important trends were detected and their effects on the competitiveness of the EU agri-food chains evaluated. On the one hand, the complete fulfilment of altering consumption patterns, due to diet changes, amongst others as a result of growing incomes, as well as the increasing demand for organic and ‘healthy’ food products is a great challenge to EU agriculture. On the other hand, trade lib-eralisation is creating new competition for the EU, while world markets with their growing price volatility are increasing the price risk of production and the income variability for farmers. In ad-dition, EU agriculture is facing a fierce structural change induced by new technologies, the pub-lic request for traceability and accountability, and the resulting necessity of capital. Neverthe-less, new income opportunities for the sector arise from these trends as well, one of them be-ing further product diversification through branding and labelling. Competitiveness is a relative and dynamic concept which can be assessed at various levels (e.g., country, region, industry, supply chain and firm). This working paper reviews the extant literature on competitiveness. It notes that most of the literature regarding agri-food industry competitiveness draws largely on trade, productivity and value added indicators and focuses on the assessment of competitiveness at the farm level, with very few studies adopting an integrated supply chain approach. In consequence, there is little research on the identification of determinants and metrics that characterise agri-food supply chain competitiveness per se. Moreover, there is little (if any) work on what defines and how to measure 'sustainable competitiveness', with most studies ignoring social and environmental considerations. Hence, to define and assess 'sustainable competitiveness' there is a clear need for a framework that combines the effect of economic, social and environmental costs and benefits. Against this background, we propose a set of criteria for selecting indicators and a conceptual framework for measuring sustainable competitiveness of the agri-food sector. Given the complexity of the supply chain, indicators should be 'comprehensive', 'illuminating', verifiable', 'useable' and 'comparable'. They also should be applicable to at least five groups of users: enterprises, policy makers, quality assurance agents, civil society and academics/research community. The conceptual framework covers five areas: sphere of enterprises, policy context, consumers, natural environment and the relationships between the agents and domains. This paper analyzes the extent to which the reduction of import tariffs - as a measure of import competition - affects the quality upgrading of the food products exported in the EU15 countries over the period 1995-2007. Product quality is inferred from trade data using the Khandelwal (2010) method. The relationship between quality upgrading and competition is studied within a ‘distance to the frontier’ model (Aghion et al., 2005). The results show the existence of an non-monotonic relationship between competition and quality upgrading, with varieties close to the world frontier more likely to upgrade quality in response to an increase in import competition. This paper provides insights into the definition of innovation and specifically how policies affect knowledge creation and innovation in agro-food supply chains (D9.1a, objective 1), considering innovation as a key determinant for competitiveness. The innovation system – rather than the linear model of innovation – will be central to our discussion. The first part of the report focuses on innovation systems. It discusses basic definitions of innovation, the relationship between innovation and competitiveness and the measurement of innovation. These three topics are discussed both in general terms and with specific reference to the agr0-food sector. Next, the report provides a conceptual framework based on the National Innovation Systems approach with reference to the agro-food sector. The second part of the report focuses on the role of policies and provides insights into the main policies set at the European level that affect research and innovation in the agro-food domain. The paper provides a comparative analysis of productivity of food processing industries among different EU countries (including Serbia). Based on a joint estimation of country-specific input distance functions and a meta-frontier analysis for four sectors, we were able to identify the various sources of factor productivity and their developments over time as well as the level and development of the technical efficiency of companies in four food processing industries. The research is based on data drawn from the Amadeus database. We discovered that intra- and intersectoral differences are important characteristics in EU food processing. Efficiency and TFP differences among food processors are significant reasons for variation in all sectors. High TFP was found in Germany, France, Italy, and the Netherlands in all sectors. TFP has a positive trend in the majority of EU member countries; only Bulgaria and Serbia are exceptions. The working paper provides an analysis of “new markets” in selected EU countries. The recent situation, development as well as challenges and tendencies on the markets for products produced and processed according to the EU quality schemes (organic products, protected designation of origin (PDO), protected geographical indication (PGI), and traditional specialties guaranteed (TSG)) will be discussed in the paper in order to identify the market potential for those products. In particular, several case studies of specific EU markets are included. There are wide variations across the EU as to the size of the current market and likely future potential for organic food as well as PDI and PGO products. Of the countries considered, geographical indications are most developed in Italy, but remain of peripheral importance in some established (e.g. UK) and new member states (e.g. Romania). In some countries, were the local market is restricted by low purchasing power, development of the organic sector relies solely on export sales (e.g. Serbia). In established member states the situation of the organic sector has been rather mixed. In Germany sales continue to grow, albeit at a slower rate than in the mid-2000s, while the UK experienced a sharp downturn after 2008. The results of our analysis show that the market was heavily influenced by EU policy (especially by financial support) and the global crisis. After many years of growth, market development has been slowed down by the economic crisis, but the first signs of reviving are starting to show, especially in the context of new EU policies for the period 2014-2020. The paper provides the findings and conclusions regarding TFP development in agriculture in EU member states. We estimated the multiple output distance function to assess the exploitation of economies of scale and production possibilities and the impact of technical change for cereal, milk and pork production in 24 EU member countries. Moreover, we conducted a metafrontier analysis for the comparative assessment of TFP differences. The results show that we can observe a positive trend in TFP in majority of EU member countries. Moreover, technical change was identified as the important factor that contributed predominantly positively to TFP development. Finally, we did not observed catching up process from between the regions. The metafrontier analysis showed that despite a period of almost 10 years after accession the productivity differences in the agricultural among as well as within countries are substantial. This paper examines the pricing behavior of EU wheat exporters. “Pricing to market” is the relationship between export unit values and the exchange rates which is estimated using quarterly data for 11 export destinations for the years 2000 to 2013. Panel cointegration methods show three results. First, there is a meaningful long-run relationship between export unit values and exchange rates. Second, there is little evidence of differential mark-ups between export markets. Belarus and Iceland are exceptions where the EU exercises local currency price stabilization, and in the long run a 1% increase in the exchange rate leads to a 0.83% decrease in export unit value. Third, the estimated speed of adjustment for Belarus and Iceland implies that a third of the adjustment to long-run equilibrium takes place in the first year following a shock with full adjustment taking 10 years. The paper investigates the determinants of innovation strategies in the agri-food sector and the potential complementarity of these strategies. Innovation strategies are distinguished as in-house and outsourcing. The choice between strategies is motivated by transaction cost minimization, property rights appropriation and optimization of firms’ resources and competences. A bivariate probit model is implemented using cross-section data on 1,393 agri-food firms in seven EU countries. Results show that: decisions to innovate in-house or to outsource are not interlinked; high quality human resources and the use of ICT influence both the decision to innovate in-house and outsourcing, while organizational aspects, especially those related to decision-making within the firm, are relevant only for in-house innovation. Finally, we also find that large and internationalized firms are more likely to innovate in-house. The paper analyzes the degree of market imperfections in the input and output food processing markets using the derived mark-down and mark-up models and employing stochastic frontier methodology. The research was based on data drawn from the Amadeus database. The estimated mark-down model revealed some degree of non-competitive behaviour in the input food processing market for all analysed sectors (slaughtering, fruit and vegetables, dairy and milling) with different degree of market imperfections among the sectors. The EU slaughtering common market is characterised by significantly greater market imperfections as compared to the dairy and milling sectors. The results of the fitted mark-up model suggest that market imperfections on the output market are not so pronounced for the slaughtering sector. The degree of market imperfections is higher for the output market in the dairy and milling sectors as compared to the input market. The fruits and vegetables sector has almost the same level of market imperfections for the output as for the input market. This paper investigates the effect of trade integration on firm-level productivity growth exploiting a large micro-dataset of French and Italian food firms, observed over the 2004-2012 period. We focus on import penetration at both industry and upstream sectors level, to study the role played by imports in intermediate inputs. Main findings show that an increase in import penetration systematically contributed to firm-level productivity growth. Yet, the productivity growth effect induced by import penetration in upstream sectors is of several orders of magnitude higher than the one at the industry level. Finally, we find a strong confirmation that the effects of import penetration are increasing with the initial level of firms’ productivity. 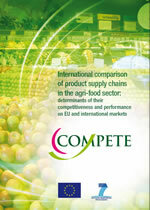 This paper seeks to build a coherent picture of the competitiveness of the EU agri-food sector, drawing on comparisons across EU MS. With the aim of gaining a deeper understanding of competitiveness, for better targeted and evidence-based policies, particular attention is paid to the main drivers of competitiveness in agri-food value chains. To this purpose, the theoretical and empirical findings from the work packages of the COMPETE project are summarised. The paper follows closely the research objectives of the project and its key objectives. For a clear and structured synthesis, the findings are classified under four main topics: (i) trade, (ii) enterprise performance, (iii) market efficiency and supply chain relations, (iv) policy measures and governance. This research provides the basis for policy recommendations. Activities for promotion of Local Slovenian food have been carried out through several national projects. One of the most prominent ones is the project Traditional Slovenian breakfast. Other projects include advertising campaigns (We Are Connected with delicacies from our countryside, Fresh food from your vicinity, Be aware of local origin), school schemes (School fruit scheme, School milk scheme), events (Goodness of farms in Ptuj, The countryside in the city), website promotion (Buy local), and brand establishment (Buy Slovenian). Besides the three European schemes in Slovenia there is also another scheme for protection, Designation of higher quality. In Slovenia are 5 protected milk products, all of them cheeses. Under the quality scheme Protected designation of origin are included: Mohant cheese, Nanos cheese, Tolminc cheese, and Bovec cheese, Under the quality scheme Higher quality is included: Semi-hard cheese without preservatives – semihard cheeses of Zelena dolina. Diary production keeps being the most important orientation of Slovenian agriculture. It accounts for about 15% of the total value of agricultural production in recent years, and 32% of the value of livestock. Milk production in Slovenia consistently exceeds domestic consumption. The paper presents important data on dairy market balances with milk and dairy products production, consumption and trade. In addition, it presents and compares prices and policies in Slovenia and the other European Union (EU) countries. Finally, it assess the market potential for organic products and products produced, processed and traded according to three EU quality schemes: protected designation of origin, protected geographical indication and traditional speciality guaranteed. The objective of this study is to contribute to the knowledge of network management, and to provide a guideline of how to keep a network vital. The focus of this study is on open innovation networks in the food and beverage industry, with Company X as a case study. A literature study and case studies results in a framework of six conditions that influence the vitality of an open innovation network. This list is used in an action research which results in more knowledge about how the conditions work in practice. The data from the literature and empirical evidence are compared, and differences and similarities are discussed. Trade-offs and synergies between the conditions are also explored. Contributing institution(s): (1)Wageningen University and (2)Startlife (NL), The Netherlands. The agri-food sector faces significant challenges, including a growing world population, globalization, and technological changes. Open innovation (OI) is becoming inevitable to deal with these challenges and for long-term competitive advantage of the agri-food companies. Startups can play a key role in corporate’s open innovation strategies. Although corporate-startup collaborations (CSCs) are already more prevalent in research and business practice in high-tech sectors, this phenomenon is new in the agri-food sector. By combining literature on CSCs in high-tech sectors with OI literature in agri-food, a framework was developed to initiate and manage CSCs. Best practices should focus on alliance formation, strategic fit, governance mode, access to resources, relationship & trust, and IP protection. A retrospective case study on StartLife and Foodcase confirmed that a CSC could be key in improving innovation performance and increasing competitive advantage. It also confirmed the importance of mediating and moderating factors influencing how the CSC leads to competitive outcomes, and that a dynamic view on the CSC is required.